Leaders of five BRICS countries – Brazil, Russia, India, China and South Africa – will meet in Johannesburg, South Africa from 25-27 July for the 10th BRICS Summit, convened under the theme: BRICS in Africa: Collaboration for Inclusive Growth and Shared Prosperity in the 4th Industrial Revolution. This is the second time BRICS’ Leaders will meet on African shores for the annual BRICS Summit. The focus of the last BRICS Summit hosted by South Africa, in March 2013, was on Africa’s development, integration and industrialisation. Bringing the Summit back to the continent challenges South Africa and other members of the grouping to candidly reflect on collective actions taken in response to pressing global challenges, as well as in honouring a commitment to Africa’s development and giving effect to a meaningful partnership with the continent. Likewise, the 10th BRICS Summit provides an unprecedented opportunity for South Africa, as the only African country in BRICS and as host and Chair of BRICS in 2018, to set the tone and direction for members to make the right choices to drive Africa’s economic transformation. As South Africa embarks on the commemoration marking the 100th anniversary of anti-apartheid stalwart and former President, Nelson Mandela, actions that advance human dignity for all and build upon the moral legacy of a shared world leader – have never been more important. South Africa joined the BRIC states in December 2010, expanding the acronym and consolidating the BRICS as a formation with a shared objective of shaping and reforming traditional norms of global governance and forging an inclusive economic growth and development agenda. As host and the 2018 BRICS Chair, South Africa has proposed new areas of BRICS cooperation that speak directly to African sustainable development priorities, as well as to the broader challenges facing developing countries. South Africa is also engaging more partners and expanding its reach beyond core BRIC members. An Africa-Outreach meeting with Heads of State and Government, intended to advance the implementation of the African Union’s Agenda 2063 through BRICS’ mechanisms, will be convened as part of the Summit. Advancing strategic cooperation in the key areas of peacekeeping, vaccine innovation research, gender, tourism and the Fourth Industrial Revolution, is particularly timely given their direct relevance to the broader sustainable development agenda. Moreover, tackling pressing challenges in these identified areas would broadly serve the interests of both developed and developing countries; and provide an additional route to identifying common solutions to shared global challenges. Promote gender responsive inclusive economic development. Singling out technological transformation, referred to as the Fourth Industrial Revolution, as a central theme for the 2018 BRICS Summit is a critical step towards shaping the agenda of the Fourth Industrial Revolution in a responsible, inclusive and human-centred manner. This is a priority, because, along with their unquestionable benefits, innovations are often accompanied by risks that need to be mitigated. In some instances, the breathtakingly vast and innovative technologies in artificial intelligence, robotics, the internet of things, autonomous vehicles, 3D printing and nanotechnology, have the potential for deepening inequality and unemployment, with particular risks for women in low-paid, poor quality jobs. Similarly, these technologies have both positive and negative implications for labour rights, the future of work, citizen participation and social protection. Advancing cooperation and peer-to-peer collaboration on effective institutional and policy responses in these and other areas, will help leverage the promise and address the challenges presented by the Fourth Industrial Revolution. With youth under 24 years representing an average 60% of Africa’s population, South Africa has the opportunity to advance an agenda that prepares and supports young people to take advantage of the Fourth Industrial Revolution. The transformative power of education in the targeted areas of science and technology, engineering and mathematics (STEM), is key. Likewise, the success of African youth in using mobile technology as a platform to unleash their entrepreneurial potential, could be further supported and replicated on the more powerful Fourth Industrialisation platforms. 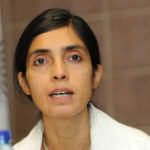 Nadira Bayat is Programme Director at Global Economic Governance (GEG) Africa. GEG is a UK Government funded policy research and stakeholder engagement programme to strengthen the influence of pro-poor African coalitions at global economic governance fora. This Blog does not represent UK Government views.